“I’ve always been passionate about interpersonal relationships and helping to give victims of oppression a voice," says Hannah Crowe-Cumella ('18) about choosing to pursue a career path in social work. "I want to advocate for those who are unable to advocate for themselves, and help people to be resilient in all walks of life." "Hannah brings such a vibrant spirit to our classrooms and to this world,” says UVM Social Work Lecturer Celia Cuddy. “She holds a heartfelt commitment to work that advances social justice and human rights, and she knows that this work happens within the context of our relationships with each other as well as in the context of community organizing efforts. I appreciate Hannah's great enthusiasm about her social work practice." Because UVM’s Social Work program has a wide-ranging network of community partners, students have many opportunities when choosing their field experiences and service learning. Currently she is an intern at the Pride Center of Vermont, working in mental health, substance abuse and domestic violence areas with a variety of people and projects. The Pride Center is a comprehensive community center dedicated to advancing community and the health and safety of the lesbian, gay, bisexual, transgender and queer (LGBTQ) Vermonters. “I think it’s a really good step into the real world,” she says. Hannah also has a deep commitment to her ongoing, year-round work with COLAGE, an organization uniting people with LGBTQ parents through a supportive network of peers who nurture and empower each other to be skilled, self-confident, and just leaders in their collective communities. "It's helped to shape me into a stronger and better person, and provided me with endless love and support," she says. Students and faculty in the social work program develop close connections with each other through a small cohort model. “Faculty, mentors and peers inspire me through example. They all touch lives through modeling how to care for yourself and being intuitive with who you are,” she says. Another important source of support is her advisor, Fiona Patterson. “She’s been my advisor for the past four years, helping me through the struggles of being a college kid and offering sound advice that she thinks is in my best interest,” Hannah explains. "I first met Hannah when she came for an initial visit to UVM, and was immediately impressed by her enthusiasm about social work, which comes from the involvement of both her parents in this profession,” Patterson recalls. “Then I became her advisor and soon realized that she also had other broad interests in science, medicine, literature and women's studies. And all the while her passion for social work has grown with her experiences in our field, especially in terms of understanding and supporting those who struggle and suffer in this often unjust world." As a result, she is working to complete two minors – one in Human Development and Family Studies, and another in Behavioral Change in Health Sciences – in addition to her Bachelor of Social Work (BSW) degree. Despite a full schedule of coursework, Hannah finds time for fun and recreation through her involvement with the UVM Outing Club and several intramural sports. Recently she began serving on the College of Education and Social Services (CESS) Student Advisory Board along with 12 other student leaders who represent the various academic programs throughout CESS. 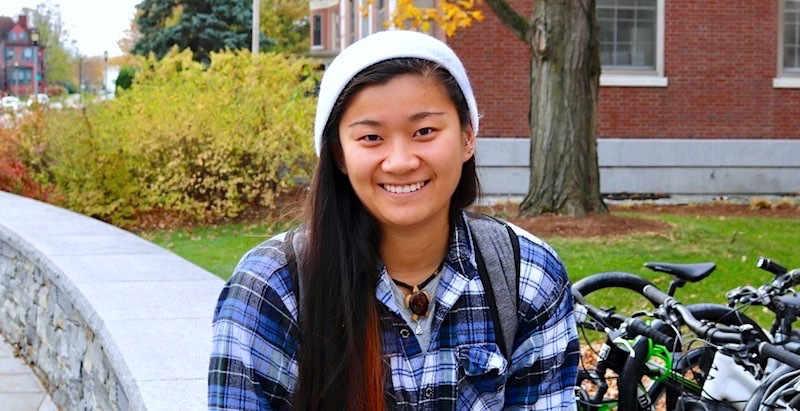 After graduation, Hannah plans to take a gap year before going to graduate school. “During my gap year, I hope to commit to a year of service somewhere across the country or abroad,” she says. “Then I will pursue my Master’s in Social Work (MSW), and hopefully become a Licensed Independent Clinical Social Worker (LICSW). I want to open my own private practice at some point and work to help counsel and support kids and young adults." Recently she received some very exciting news, being accepted as an Advanced Standing student in the MSW Clinical Practice Social Work Program at Boston College.